This is technically a monthly review plus 10 days, but will bring us right up to date with the end of July and from here on we can have a proper monthly review. This review is for the period from the 21st of June to the 31st of July. The next review will be for the month of August. In total we placed 108 bets and won 39 of them (36.1%). 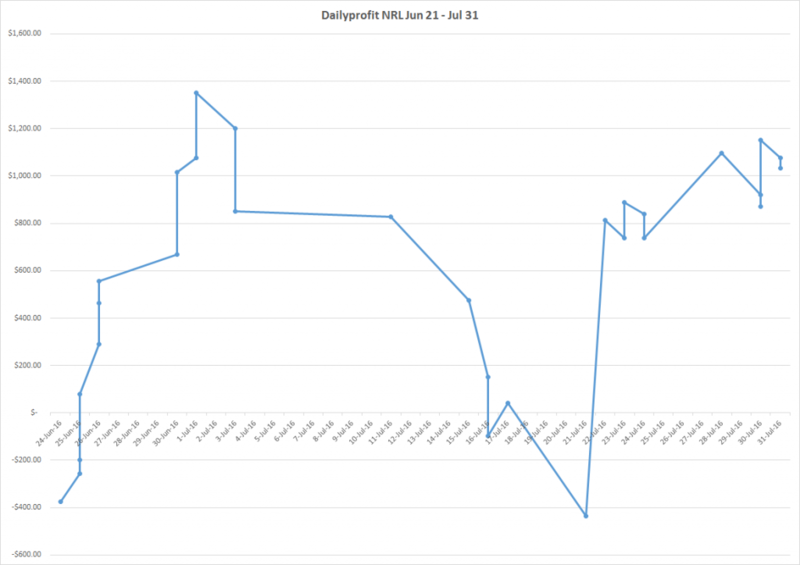 We placed bets totaling 179.65 units ($17,965.00) and lost 15.6064 units ($1,560,64). That is a -8.69% ROI. The previous update was a +22.9022 profit. 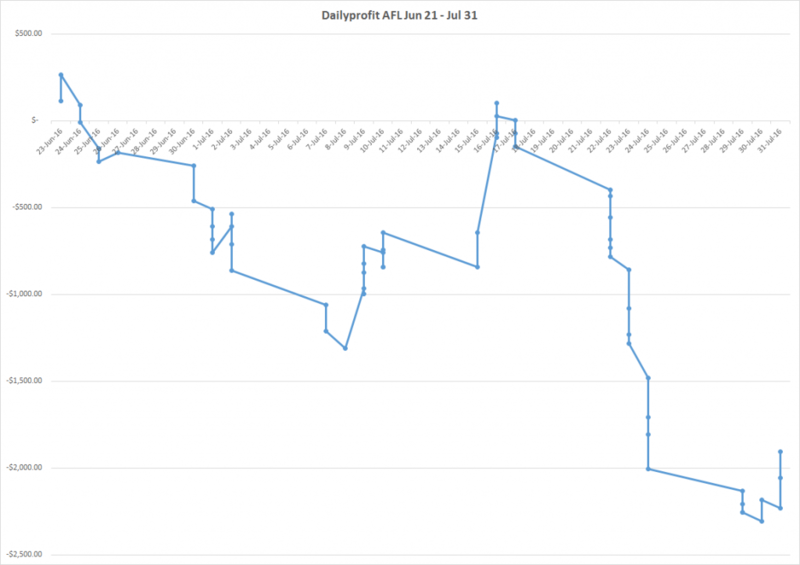 It was a month of going nowhere until a drastic drop between the 22nd and 25th of July. AFL accounted for the large drop during this period. In total we placed 63 bets and won 21 (33.3%). There were 26 head to head bets and 37 Line bets. The H2H bets lost 13.5650 units and the Line bets lost 5.50 units. 82.90 units ($8,290.00) were bet for a loss of 19.0650 units ($1,906.50). That is a -23.00% ROI. These do not excuse the loss, just showing how close we came to some nice winners during the month. The AFL season has been very poor, losing a total of 20.4551 units at -8.23% since the start of the season. 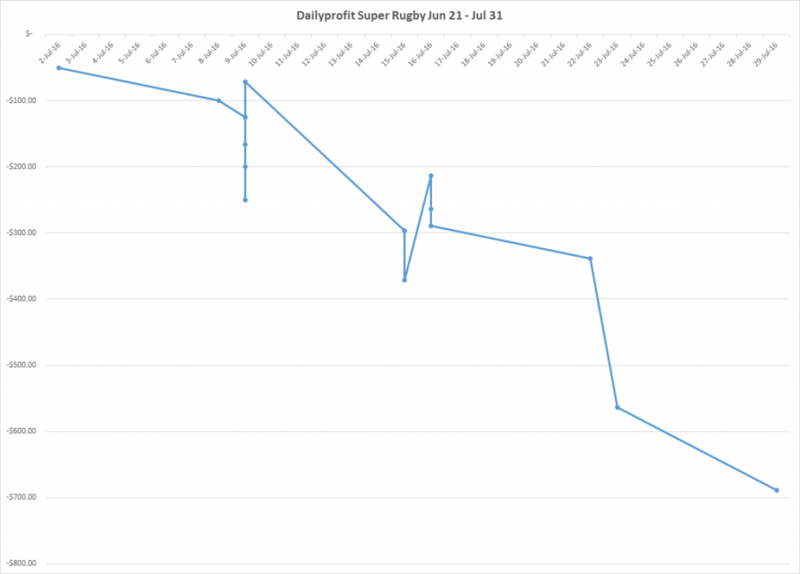 The NRL continues it’s impressive season with another 10.3457 units profit. That brings this seasons profit to 31.0385 units at 10.82%. In total we bet 80 units ($8,000.00) and made a profit of 10.3457 ($1,034.57). That’s an ROI of 12.93%. There were 30 bets and we won half of them. With only the final left, we are all happy that this season is over. We bet a total of 16.75 units ($1,675.00) and lost 6.8871 units ($688.71) at a -41.12% ROI. We won just 3 of 15 bets. This seasons (with 1 game to go) total loss is 23.4432 units at a -20.79% ROI. By far the worst performing SP model ever. 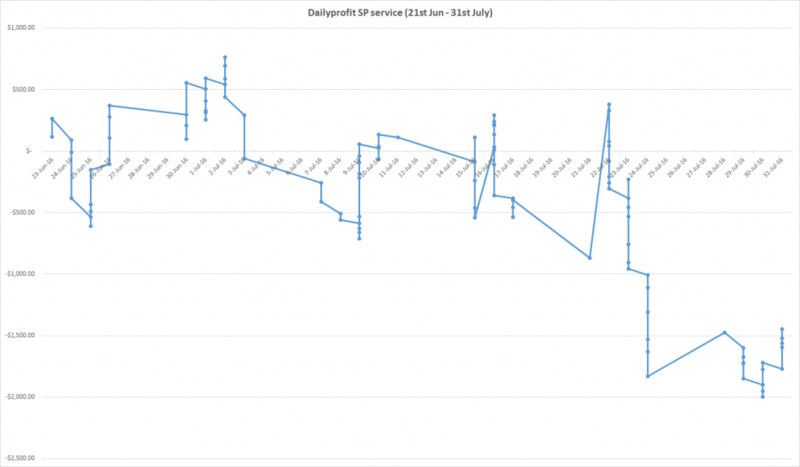 A poor month and 10 day period for the SP service. Hopefully the AFL model gets back on track for the final few months of the season and the NRL model continues to perform. It will be a low turnover month as we will only be betting on those two sports. But in September the NFL season kicks off and the end of October will see the NBA season start. The results spreadsheet is updated every Monday night and uploaded to the site for anyone to download. You can click the link below to grab it and see how we did on all our bets.